Hello, I'm Jack J and this is my new blog for my wee underground publishing house! Haha!! That cracks me up every time!! "Publishing house". LOL. Look, I put out two small film fanzines and that's about it. I've also written a couple of DVD booklets for Another World Entertainment (AWE) but obviously I have nothing to do with those releases as soon as I've handed in my work. Everyone else who makes a DIY fanzine doesn't even talk about publishing a mag! Well, I know I'm not fooling anyone but to me it's just a fun way of dealing with all the stuff that goes into making a fanzine, I mean the stuff other than writing the reviews! You know, hard work such as putting copies of the mag into envelopes and walking all the way down to the mailbox, having to scan tons of video sleeves, sending off stuff to the printers, or to have groupies come over (you didn't know?? Yup, fanzine editors are popular among groupies, very much like rock stars). Someone else goes to footy matches on Sundays or gets fucked up on substances. Me, I collect psychotronic films and once in a blue moon I put out a zine about some of them. That's all it is, it's not gonna get me rich or anything. Usually I break even in regards to what I've spent printing and distributing the bloody thing but that's about it. It's purely for the love of it (ahhhh). The two mags that I publish are BANNED IN BRITAIN (BiB) and STAY SICK! (SS!). BiB is written entirely in English and SS! is in Danish. Other than language they also differ in regards to what they cover; BiB started out as a full-on splatter movie mag and SS! 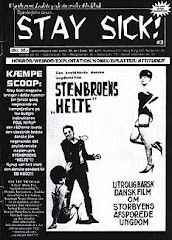 is an all-round psychotronic magazine that not only covers movies but also the occasional book, comic book or record. I'm sure some of my Danish readers are gonna moan and wince about my future info posts being in English but I must admit I think dual language blogs are a mess. Stick to ONE lingo and keep it simple. That's what I say (and yes thanks for pointing out that I have posted in both English and Danish on my other blog En lejemorder ser tilbage, LOL). I'm pretty much alone in the Danish and Scandinavian film underground. 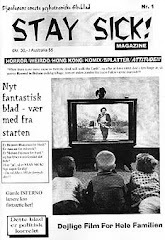 Banned in Britain is the only English language zine in Scandinavia and Stay Sick! 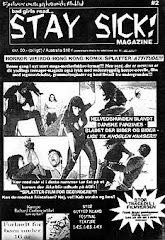 is one of the very few zines in Denmark. I believe there are only two other mags here at the moment. This blog isn't going to be daily updated like a regular blog but merely a place where I can bring you info on upcoming issues, ordering info, avability of old issues and whatever, once in awhile. Lastly, why "It's Grim Up North"??? Well, at the end of 1990 I moved to Denmark after having spent a good deal of the 80s in London. The KLF song by that title came out soon after and for some reason it just stuck with me. I had moved from cool London to this godforsaken windy place up north. I realise the song is about northern England and not northern Europe, but still, I sensed a kinship with the mood of that track. And the rainy images from the video (obviously I'd bought a satellite dish so I could still watch UK tv) sure resembled the place I had moved to! - Oh, and I thought it was a bloody good name for an underground publishing house, haha.